You can keep adding notes as always. Once you have finished entering your note in the *Condition Notes* box and you are ready to submit your listing, simply click Add to Batch (*do not* click the Add Notes button). 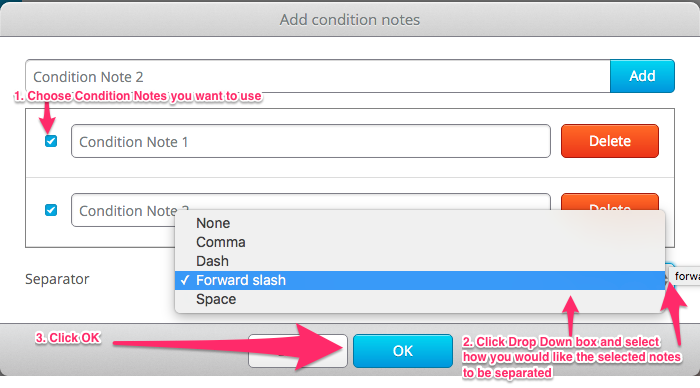 TIP: This feature can be helpful if you have condition notes that you commonly use. Now, the Condition Note will appear in a list underneath and you will have the choice to select a check box next to it if you'd like to use it immediately. Click the Add Notes button-->Check the box next to the note(s) you would like to use in the order you would like them displayed-->From the Separator dropdown, you can choose how you would like the notes you have selected to be separated (comma is the default, but you have a number of options).